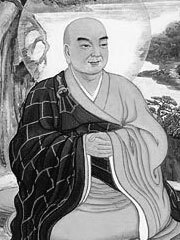 Huiyuan (334 AD–416 AD, also spelled Hui-Yuan or Hui-Yüan), Chinese 慧遠, was a Buddhist teacher who founded a monastery in Jiangxi province and wrote the text A Monk Does Not Bow Down Before A King (404 BC). He was born in Shansi, China and died in Hupeh. He lived in the Eastern Jin Dynasty. Huiyuan began studying Zhuangzi and Laozi but at the age of 21 he was converted in Hebei Province by Dao An. Later, he lived at East Forest Temple (東林寺) at Mount Lushan. His teachings were various, including the vinaya (戒律), meditation (禪法), abhidharma and Prajna or wisdom. He was posthumously named First Patriarch of the Pure Land school. His disciples included Huiguan (慧觀), Sengji (僧濟), and Faan (法安).